Cedar decks provide a sturdy and rich-colored wood addition to the home. Cedar, like most woods, require a yearly application of water sealer to protect it from rain and dust permeating its surface. An unsealed cedar deck can deteriorate rapidly as discoloration sets in, and the swollen wood rots over a period of time. Protect your cedar deck from wood rot and a worn appearance by applying a water sealer correctly. Remove all items including furniture from the deck. Sweep and wash the deck water and a mild dish soap. Allow the cedar wood to dry completely before applying the sealer. Fill a garden pump sprayer with the deck sealer. Pump the sprayer four to five times. You will need to pump the sprayer periodically to maintain adequate pressure as you spray. Start spraying at the back of the deck. You want to work your way off the deck and not trap yourself into a corner. Position the nozzle 6 to 8 inches from the surface of the deck. Spray the wood, working the nozzle slowly back and forth. Ensure the cedar wood is completely covered as you spray. As the sprayer loses pressure, pump it four to five times. Spray any railings and stairs on the deck. Continue spraying, sealing the entire surface of the cedar deck. 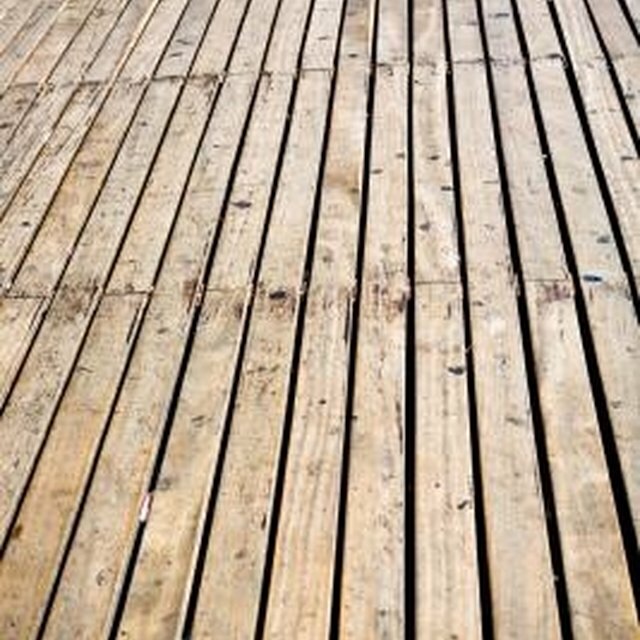 Avoid walking on the deck for 24 hours to give the sealer time to dry. Use a sprayer instead of a roller for an even application.